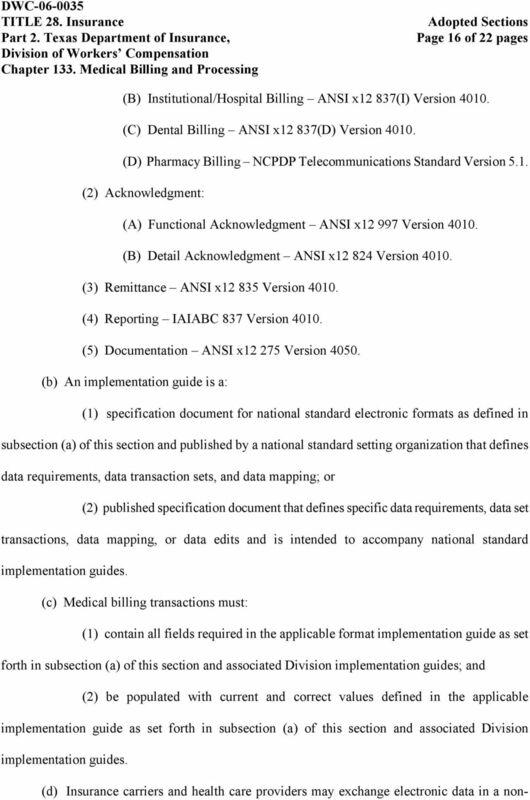 Download "Subchapter G. Electronic Medical Billing, Reimbursement, and Documentation 133.500 & 133.501"
2 Page 2 of 22 pages vendors. Because minimal electronic billing occurs in the system, initial estimates indicate a potential for significant reductions in the administrative costs and handling time for medical bill processing through the use of electronic processing. Previously, insurance carriers report only professional and hospital bill payment data to the Division in electronic file formats. 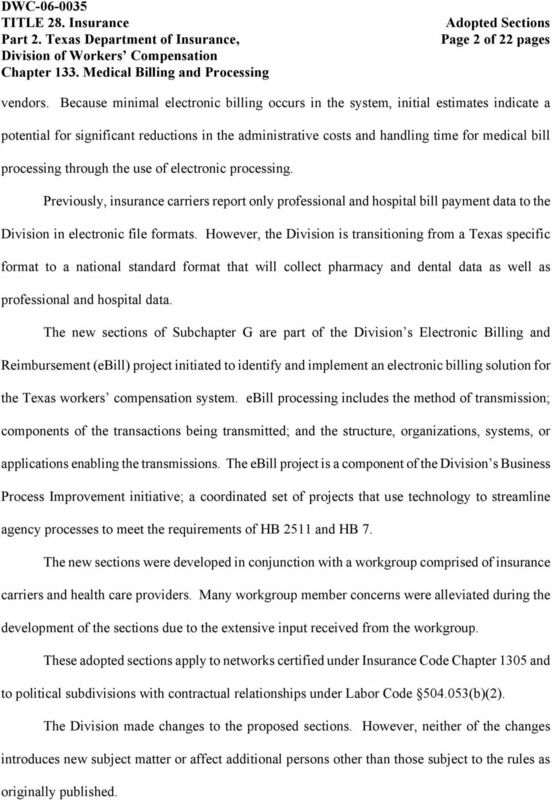 However, the Division is transitioning from a Texas specific format to a national standard format that will collect pharmacy and dental data as well as professional and hospital data. 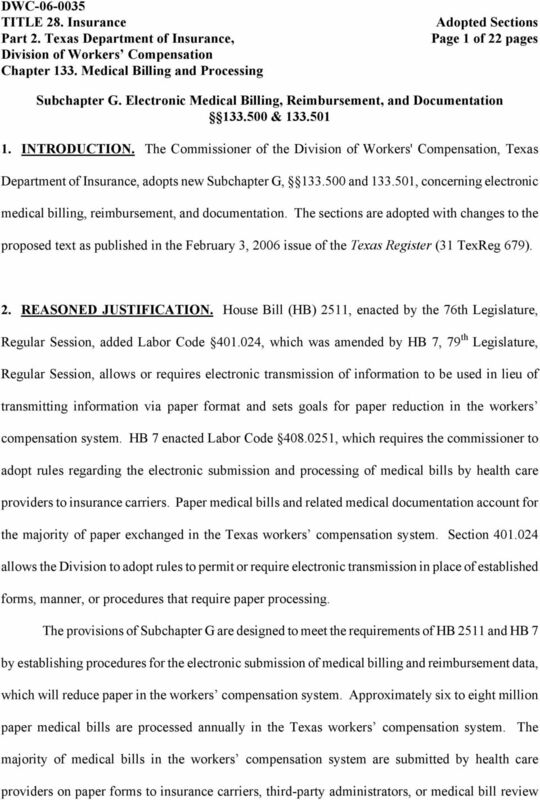 The new sections of Subchapter G are part of the Division s Electronic Billing and Reimbursement (ebill) project initiated to identify and implement an electronic billing solution for the Texas workers compensation system. ebill processing includes the method of transmission; components of the transactions being transmitted; and the structure, organizations, systems, or applications enabling the transmissions. The ebill project is a component of the Division s Business Process Improvement initiative; a coordinated set of projects that use technology to streamline agency processes to meet the requirements of HB 2511 and HB 7. The new sections were developed in conjunction with a workgroup comprised of insurance carriers and health care providers. Many workgroup member concerns were alleviated during the development of the sections due to the extensive input received from the workgroup. These adopted sections apply to networks certified under Insurance Code Chapter 1305 and to political subdivisions with contractual relationships under Labor Code (b)(2). The Division made changes to the proposed sections. However, neither of the changes introduces new subject matter or affect additional persons other than those subject to the rules as originally published. 8 Page 8 of 22 pages Reimbursement Rules ( and ). The Division will take into consideration the deadline for transition to the NCPDP Universal Claim Form in another rule initiative (b): Several commenters recommend implementation guides be finalized 180 days prior to January 1, 2008 and any subsequent changes reflected in a subsequent version of the format with 90 days notice prior to implementation. Agency Response: The Division clarifies that the implementation guides adopted by HIPAA rules are currently available to the public, with the exception of the NCPDP format. The Division specification documents will be made available as early as possible for review and comment. 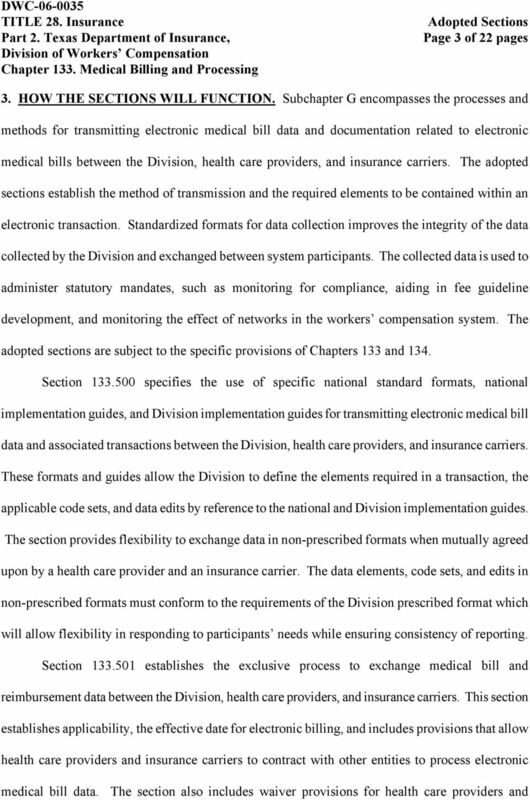 It is the Division s goal to comply with the commenters request for at least 180 days prior notice of the initial implementation guides and, to the extent possible, at least 90 days notice of subsequent changes (a)(1): Some commenters recommend changing language in (a)(1) to "priority" rather than exclusive because of potential computer system problems and the cost to implement electronic processes. Agency Response: The Division declines to make the requested change. The rule includes provisions for health care provider and insurance carrier waivers from the requirement to exchange data electronically and provisions to exchange data in non-prescribed formats by mutual agreement. The Division anticipates that the costs to implement electronic processes are offset by the savings achieved by reducing paper processes. The Division will consider the financial impact when considering waiver requests. 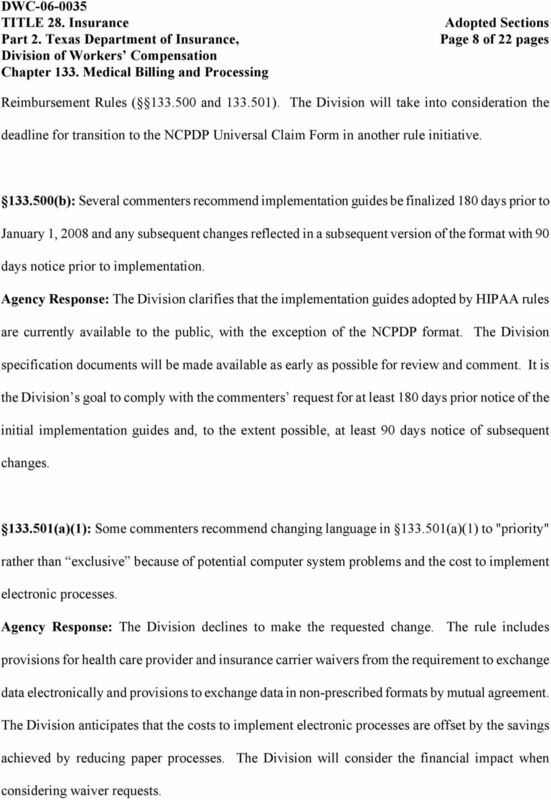 9 Page 9 of 22 pages (a)(2) and (3): A commenter supports a January 1, 2008 implementation date. Several commenters support the health care provider waiver requirements. 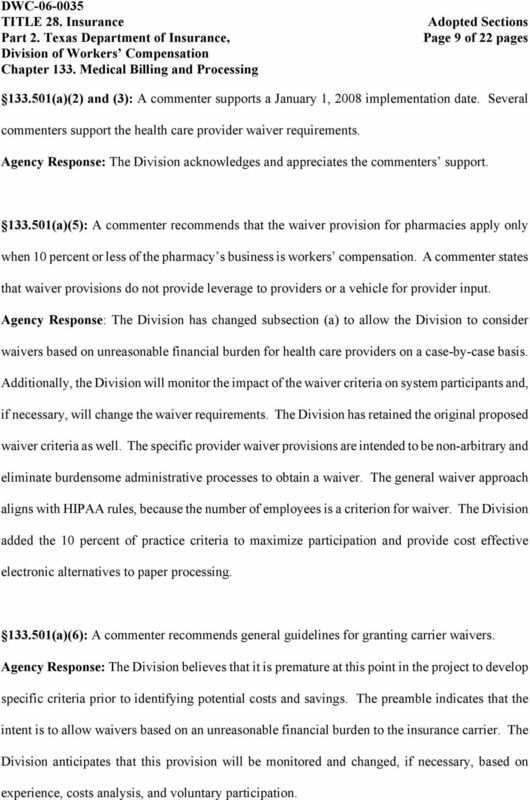 Agency Response: The Division acknowledges and appreciates the commenters support (a)(5): A commenter recommends that the waiver provision for pharmacies apply only when 10 percent or less of the pharmacy s business is workers compensation. A commenter states that waiver provisions do not provide leverage to providers or a vehicle for provider input. 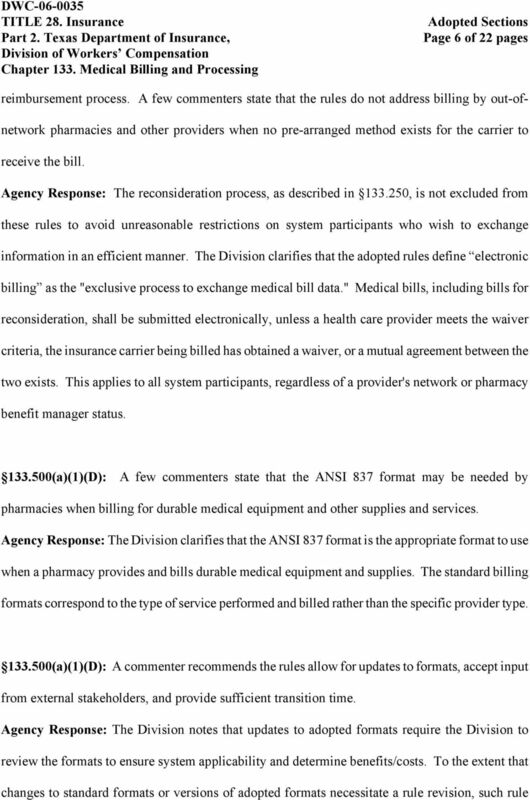 Agency Response: The Division has changed subsection (a) to allow the Division to consider waivers based on unreasonable financial burden for health care providers on a case-by-case basis. Additionally, the Division will monitor the impact of the waiver criteria on system participants and, if necessary, will change the waiver requirements. The Division has retained the original proposed waiver criteria as well. The specific provider waiver provisions are intended to be non-arbitrary and eliminate burdensome administrative processes to obtain a waiver. The general waiver approach aligns with HIPAA rules, because the number of employees is a criterion for waiver. The Division added the 10 percent of practice criteria to maximize participation and provide cost effective electronic alternatives to paper processing (a)(6): A commenter recommends general guidelines for granting carrier waivers. Agency Response: The Division believes that it is premature at this point in the project to develop specific criteria prior to identifying potential costs and savings. The preamble indicates that the intent is to allow waivers based on an unreasonable financial burden to the insurance carrier. The Division anticipates that this provision will be monitored and changed, if necessary, based on experience, costs analysis, and voluntary participation. 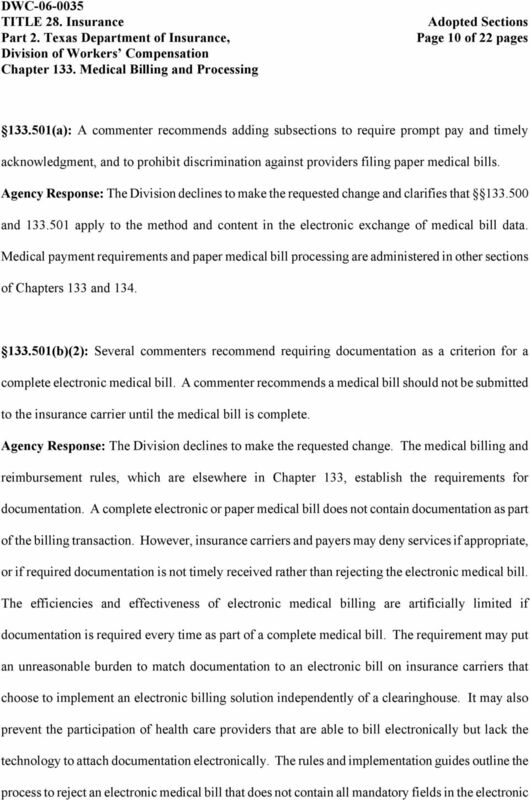 11 Page 11 of 22 pages file format (b)(2): Several commenters recommend adding a "documentation" flag to the definition of a complete medical bill. 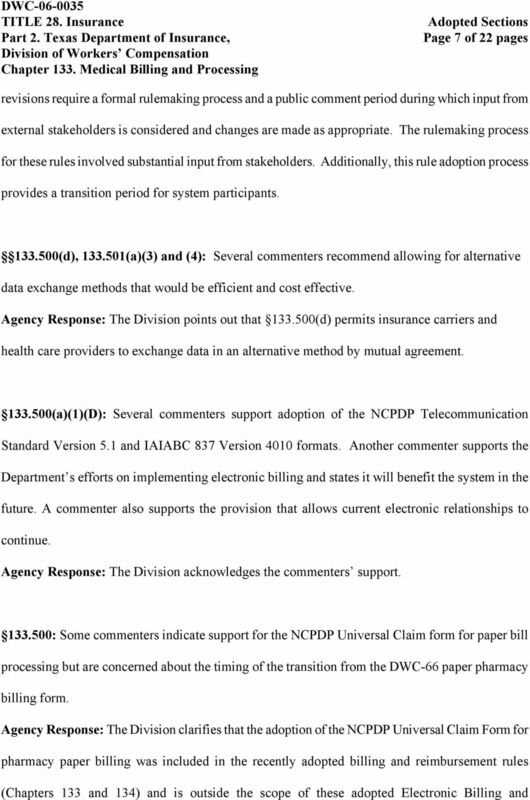 Other commenters recommend adding specific elements to the definition of a complete medical bill. Agency Response: The Division declines to make the requested change. 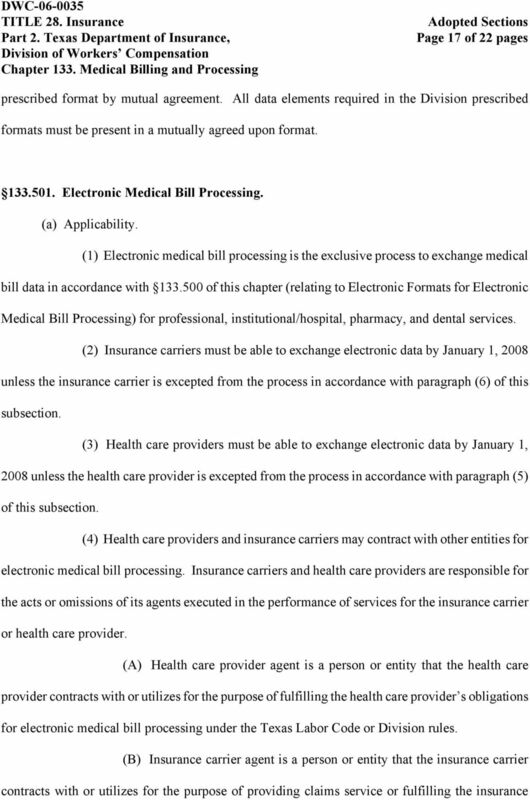 The definition of a complete electronic medical bill relates to the bill data in an electronic file format. Documentation requirements are addressed in other sections of Chapter 133. Insurance carriers and payers may deny services if appropriate, or if required documentation is not timely received rather than rejecting the electronic medical bill. The efficiencies and effectiveness of electronic medical billing are artificially limited if documentation is required every time as part of a complete medical bill. Additionally, specific data elements are defined in the national standard implementation guides and Division specification documents (c)(3): Several commenters recommend changing the 24-hour acknowledgement requirement to "one business day" and changing detail acknowledgement to functional acknowledgement. 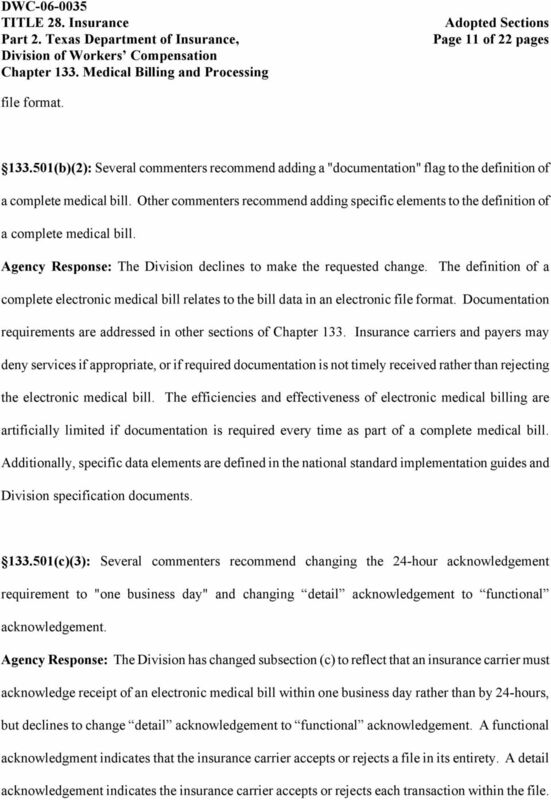 Agency Response: The Division has changed subsection (c) to reflect that an insurance carrier must acknowledge receipt of an electronic medical bill within one business day rather than by 24-hours, but declines to change detail acknowledgement to functional acknowledgement. A functional acknowledgment indicates that the insurance carrier accepts or rejects a file in its entirety. 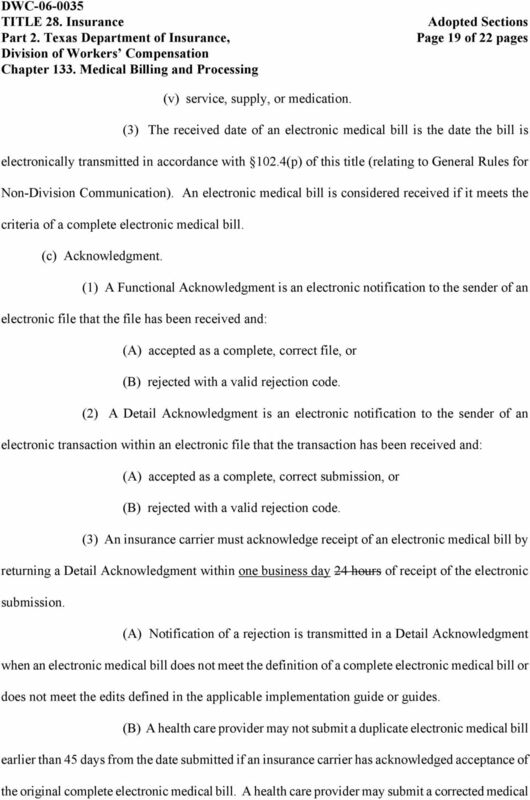 A detail acknowledgement indicates the insurance carrier accepts or rejects each transaction within the file. 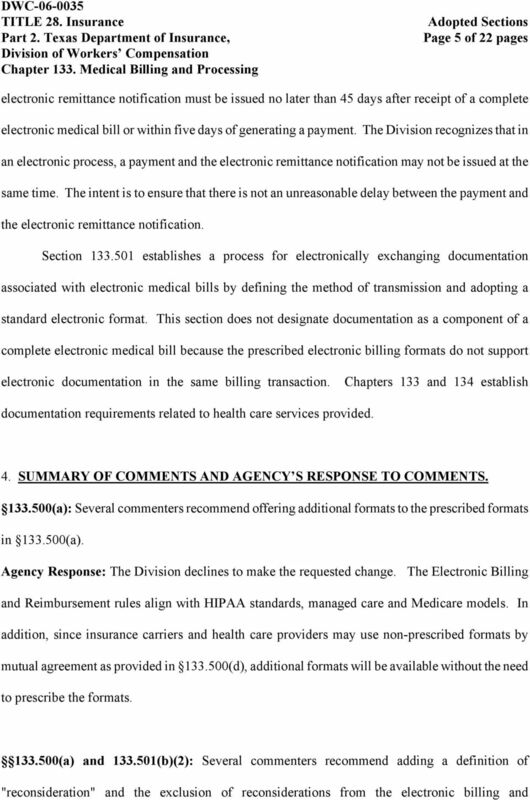 13 Page 13 of 22 pages (e)(3): Some commenters recommend extending the seven-day time frame for health care provider submission of electronic documentation associated with an electronic medical bill to 14 or 21 days. Agency Response: The Division declines to make the requested change. If there is a known delay before documentation is available, a health care provider may delay submission of the electronic medical bill. Requiring an insurance carrier to hold an electronic medical bill for 14 to 21 days before audit is an unreasonable burden. 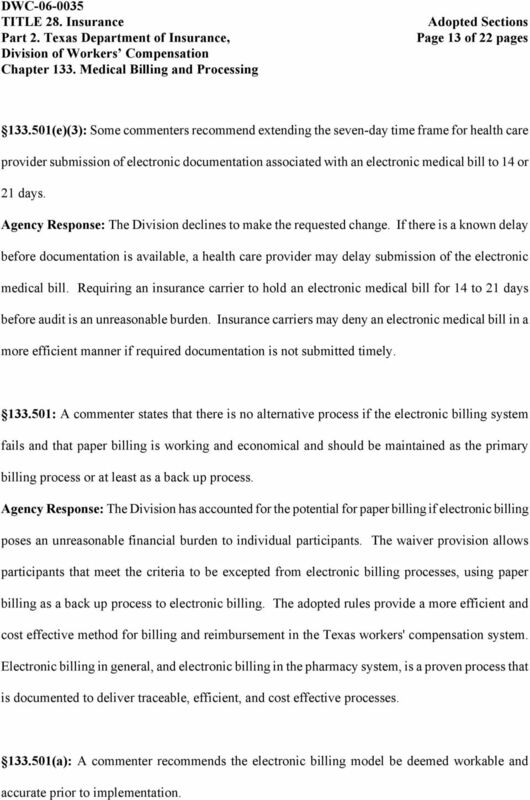 Insurance carriers may deny an electronic medical bill in a more efficient manner if required documentation is not submitted timely : A commenter states that there is no alternative process if the electronic billing system fails and that paper billing is working and economical and should be maintained as the primary billing process or at least as a back up process. 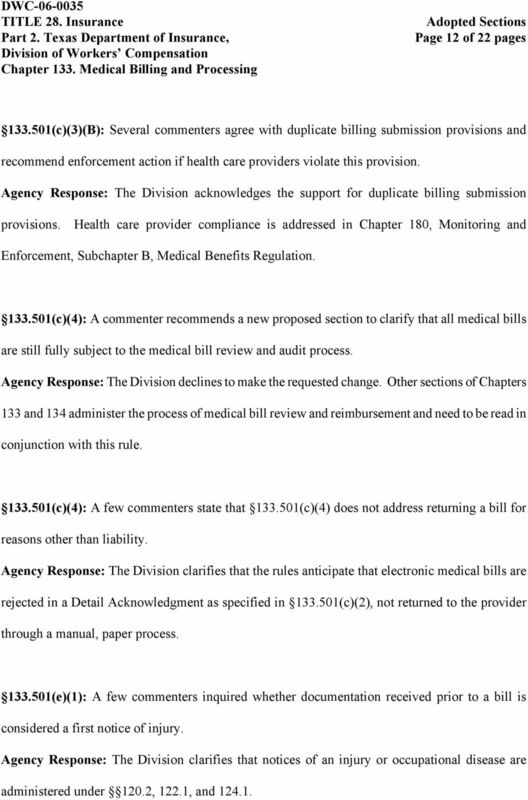 Agency Response: The Division has accounted for the potential for paper billing if electronic billing poses an unreasonable financial burden to individual participants. The waiver provision allows participants that meet the criteria to be excepted from electronic billing processes, using paper billing as a back up process to electronic billing. 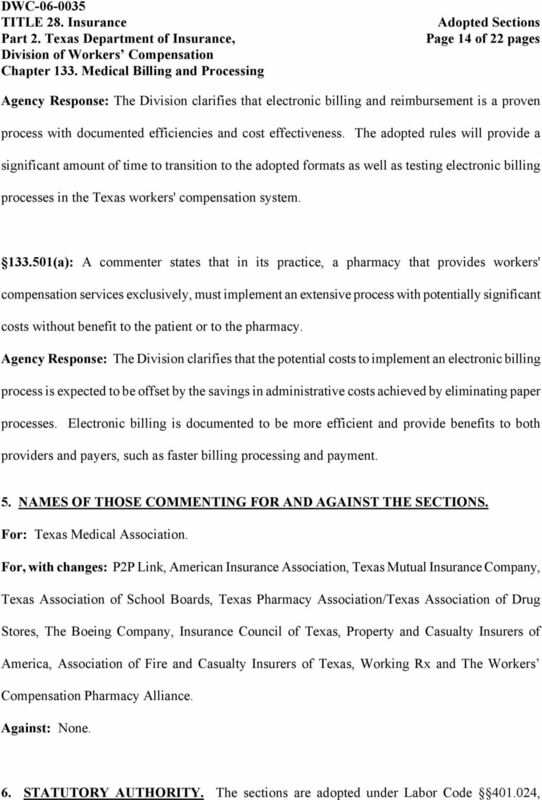 The adopted rules provide a more efficient and cost effective method for billing and reimbursement in the Texas workers' compensation system. Electronic billing in general, and electronic billing in the pharmacy system, is a proven process that is documented to deliver traceable, efficient, and cost effective processes (a): A commenter recommends the electronic billing model be deemed workable and accurate prior to implementation. 15 Page 15 of 22 pages , , , , , , , and Section provides the commissioner the authority to permit or require by rule the use of facsimile or other electronic means to transmit information in the system. Section requires the commissioner to specify by rule the reports a health care provider is required to file. Section gives the commissioner the authority to adopt rules in cooperation with the commissioner of insurance regarding the electronic submission and processing of medical bills by health care providers to insurance carriers. 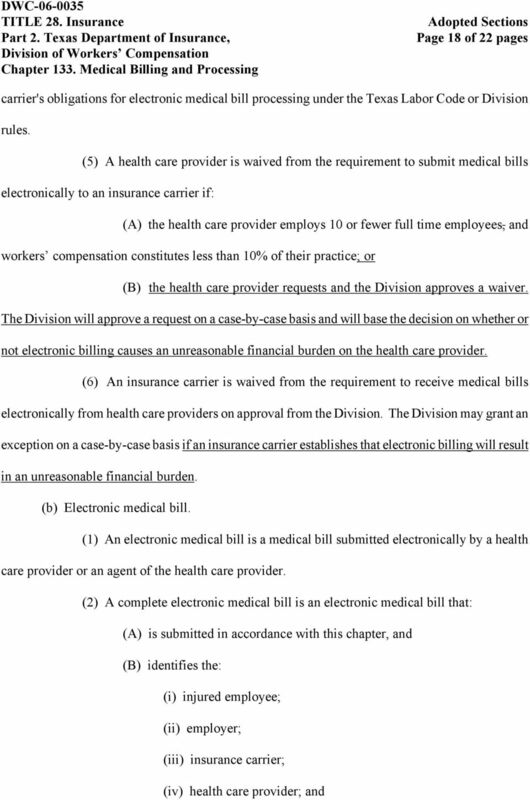 Section provides for payment of health care providers by insurance carriers and subsection (g) requires the commissioner to adopt rules as necessary to implement the provisions of and Section directs the Division to maintain a statewide database of medical billing information. 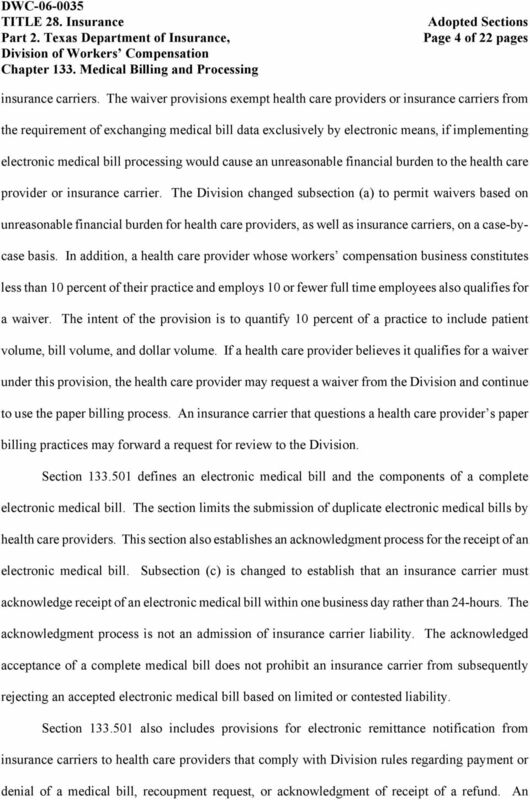 Section authorizes the Division to collect certain medical bill and payment information from the insurance carrier. Section gives the commissioner the authority to establish standards of reporting and billing governing both form and content by rule. Section provides that the commissioner of Workers Compensation shall exercise all executive authority, including rulemaking authority under Title 5 of the Labor Code and other laws of this state. Section provides the commissioner the authority to adopt rules as necessary to implement and enforce the Texas Workers Compensation Act. 7. TEXT Electronic Formats for Electronic Medical Bill Processing. (a) The Division prescribes standard electronic formats by adopting the following implementation guides for the medical billing transactions: (1) Billing: (A) Professional Billing ANSI x12 837(P) Version 4010. 21 Page 21 of 22 pages (i) injured employee, (ii) insurance carrier, (iii) health care provider; (iv) related medical bill(s), and (v) date(s) of service. 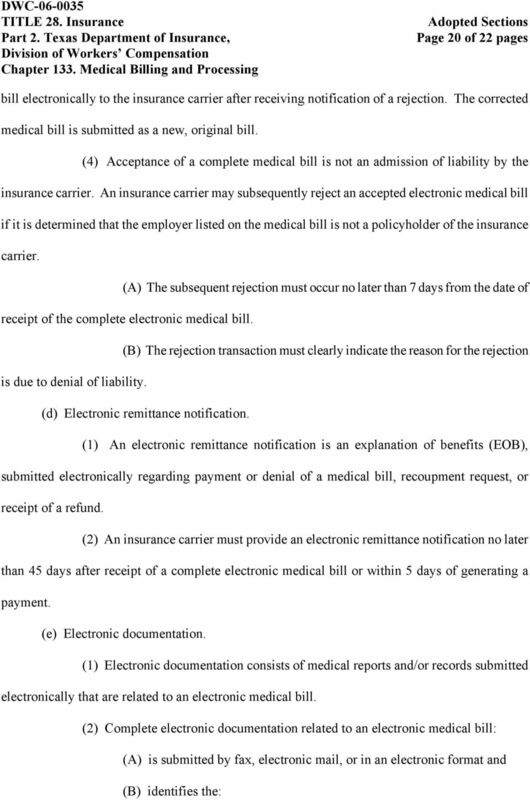 (3) When a health care provider submits electronic documentation related to an electronic medical bill, the documentation must be submitted within 7 days of submission of the electronic medical bill. CERTIFICATION. This agency certifies that the adopted sections have been reviewed by legal counsel and found to be a valid exercise of the agency s legal authority. 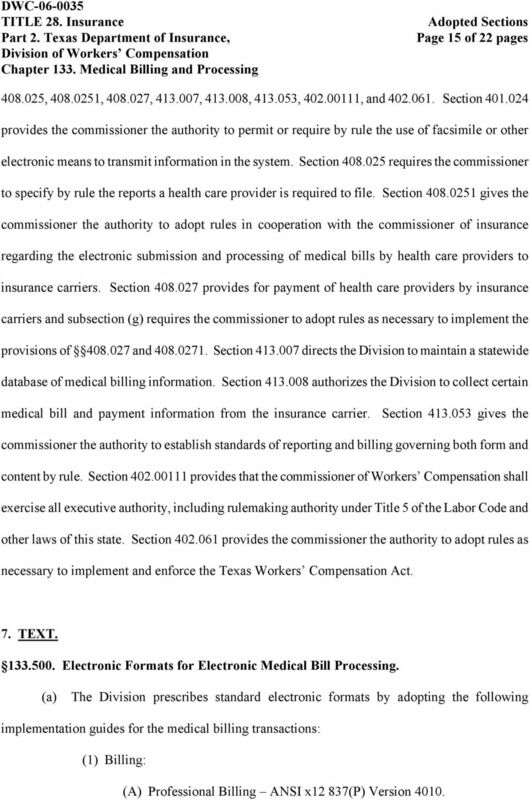 Issued at Austin, Texas, on, Norma Garcia General Counsel Texas Department of Insurance IT IS THEREFORE THE ORDER of the Commissioner of Workers Compensation that Subchapter G, and , concerning electronic medical billing, reimbursement, and documentation, is adopted. AND IT IS SO ORDERED.